Excess amounts of refined sugar lurks in many foods that we enjoy consuming. The American diet relies on sugar substances as instant energy sources, spiking blood sugar levels-leaving you craving more. Sugar and other process foods do not provide any nutritional substance and contribute to many diseases, including diabetes and obesity. So how do we break the cycle? We may not all crave it, but it’s there…lurking in many foods that we enjoy consuming. Sure, you’re probably aware that processed foods may consist of unhealthy ingredients, but did you realize that many items, such as marinades, salad dressings and tomato sauce, contain sugar? The modern American diet relies on sugar for instant energy by spiking blood sugar levels, leaving you to crave more. Refined, white sugar, including sucrose and high fructose corn syrup, does not contain any substantial nutrients and contributes to diabetes, obesity, and other metabolic diseases. The extra calories from excess sugar consumption will get stored by your body and potentially contribute to weight gain. Because of this, experts who research dietary guidelines recommend that no more than 10 percent of your calories come from added sugar. The guidelines are published every 5 years as for the American public and reflect the current dietary trends in nutrition science. So how do you cut back on sugar intake? 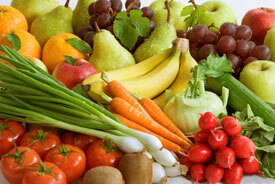 * Add protein and high-­‐fiber foods, such as leafy greens and legumes to your diet. This will make you feel “full” and deter cravings. * Reduce or eliminate sodas and sugary drinks by replacing them with water or herbal teas. * Limit caffeine. Caffeinated drinks, such as coffee act similarly to sugary substances by providing jolts of energy. Although studies have shown some benefits to drinking coffee, by switching to decaffeinated teas instead of relying on coffee for “pick me ups” is better for stabilizing blood sugar levels. Making a conscious effort to limit your sugar intake and maintain naturally stable blood sugars will allow you to ward off potential diseases and keep unwanted pounds off.